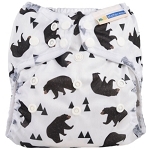 Little lamb bamboo nappies are a great fitted nappy available in 3 sizes,size 3 is for older toddlers and children for that aren't dry at nigt the booster is attached at the front of the nappy it can either lay flat or you can fold it towards the front for little boys. 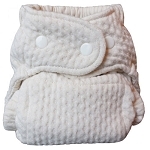 Each nappy comes with a fleece liner so you can choose whether to have a stay dry nappy or natural fabrics next to babies skin.When it comes to a thirsty nappy, the little lamb bamboo fitted is it, used with a LittleLamb bombproof wrap it'll absorb most of what your baby can throw at it, or why not try a disana or imagine wool pull on wrap for overnight. 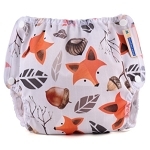 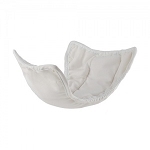 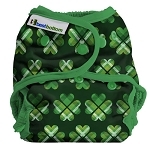 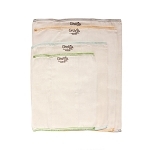 All bamboo nappies come with a fast dry fold-out bamboo booster sewn in place except for the size 1 which now comes with a separate bamboo booster as parents told us that on a newborn the extra absorption wasn't needed.